On Second Thought: ‘The Relic’ Is A Really Good Creature Feature Horror Movie! With the abundance of CGI in horror movies nowadays (although there are a few exceptions), it’s nice to take a trip down ‘Practical Effects Lane‘ once in a while and appreciate a simpler time when a movie monster didn’t look like a video game. Oh – slight disclaimer: There are quite a few beheadings in this movie. But as you can see from the clip, the practical effects on the monster are rather impressive. And it will be no surprise to anyone that those effects were done by Stan Winston’s FX company. I do love me a good ‘creature feature’ movie and love it even more when I can see the work that’s put into creating the monster. And if you have the same goals while watching a monster movie and you haven’t seen The Relic, then seek it out and enjoy the throwback nature of it. Did I mention it’s set in Chicago btw??? I’m from that area, so that enhanced my experience. I’m sure that fact bored the hell out of you. Tired of your old coffee mug? Have you been craving one that reminds you of a large demonic creature from the depths of hell that comes to exact revenge thanks to a creepy witch summoning him? If you can’t read or maybe don’t have your glasses on, I’ll tell you what that is. 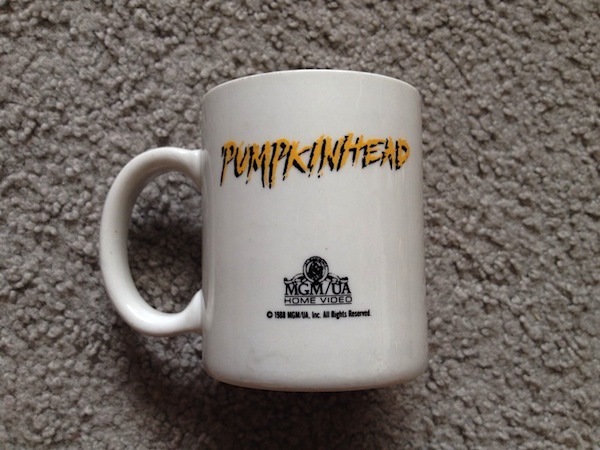 It’s a rare Pumpkinhead promotional coffee mug given out to video shop owners back in 1988 when the movie was released on VHS. Now even though it doesn’t have the face of the great creature that the late Stan Winston created, it’s still a nice little slice of horror nostalgia, especially if you’re a coffee drinker. Head on over to the listing HERE on Ebay and ‘Buy It Now’ for a reasonable $17!